Richard Dunn continued on his quest to discover more about what was recorded in Jalan Astern on a trial with me to various sites in and around Johor Baru. One of the highlights yesterday was the discovery that our grandfathers knew each other in JB and the 1936 news report Richard uncovered, even had both our grandfathers’ names written on the same line! This connection in badminton reminded me of historical details that mum's eldest brother, Uncle Roland, shared about the Malaysian team who won the prestigious Thomas cup in the inaugural games in 1949, for a documentary programme. The photo of Richard's and my grandfather was in fact, a memento with the winning team of the Foong Seong Cup in 1939! I arranged to meet with my friend Abdul Rashid Mammod, the best person I know to share more information about Johor history and the state's new administrative centre. A few years ago, I met Rashid, the Customer Relations Executive with Cahaya Jauhar, master developer of Kota Iskandar, in a guided tour of Kota Iskandar. He was such a fountain of information that I had to ask him to help out and he kindly obliged in spite of the short notice and taking time out from his weekend. I had given Rashid a brief about why Richard and his wife were in JB, his interest in the Johor sultanate, the JMF and how they were also keen to learn more about our State Assemby. Rashid shared his knowledge, with interesting details from the inspiration for the buildings' architectural designs to the historical records of Johor's constitution, all of which were of great interest to our visitors. Richard and Lindsay were impressed with Rashid's knowledge from the very start as he introduced them to the pairs of cannons at the front steps of the Sultan Ismail Building. As Lindsay read out the Latin inscriptions on the cannons, Rashid confirmed that they were gifts of friendship to the Johor Sultan present by Queen Victoria! Then we toured Siar Jauhar Gallery in the Sultan Ismail Building, a section of the adjoining mosque and the State Assembly Hall. I was more than pleased that our morning at Kota Iskandar was well spent, especially with the informative commentary by Rashid. I had also arranged for our visitors to meet with Mr Shanmugam Subbiah, a friend from the JB Rotary Club and a history buff. I know surgeons should be addressed as "Mr" but he's fondly called, Dr Shan, and I believed that he could share with Richard, further insights into Johor history. And I was not wrong. Dr Shan also invited David, an Englishman and fellow member of JB Rotary Club, to meet with our visitors so we had quite a lively party over lunch. They had much in common to talk about and I was pleased that they got on like wildfire! After lunch, I handed Richard and Lindsay over to the good hands of Dr Shan and David for the afternoon. I knew that among other interesting things, they would show our visitors the new premises of the Johor Cultural and Sports Club. Last night, on our way back from the show at the JB Classical Music Fest, I drove along Jalan Skudai and pointed out the cool clubs and restaurants happening on that strip. Our visitors then decided to go there for their dinner on Saturday night. Richard, a serious rugby fan, told me about an important match that evening and hoped to watch a live telecast here. Applying his resourcefulness, he managed to track down a pub that was screening this game and made plans to watch it there. The next morning, I was told about their pleasant dining experience at Sea & Saw and adventure with the taxi driver who took them to the Permas Jaya branch of that pub - which was NOT screening the rugby match - and how they found their way back to the city branch of the pub where they caught the second and more exciting half of the game! Lindsay said they met some "nice lads" in the pub while Richard was all smiles because England emerged the winner! He was also rather chuffed because he received a reply to his letter to the Johor Sultan! In fact, it was an email from Dato' Abdul Rahim Ramli, President of the Johor Council of Royal Court. As soon as he received it, Richard shared it with me and as I read it, I couldn't help myself from punching the air with a resounding, "Yess!!" I was much relieved that our postal system is on track and that faithful postman did his job so that Richard's letter finally reached Istana Bukit Serene! We discussed this reply from Dato' Rahim and I saw how simply delighted Richard was to get a response to his painstakingly handwritten letter. Aware that there was not enough time to do more, he said he would reply the email and make advance arrangements with through this avenue when he planned his next visit to JB. It was a positive start to our day and we had the whole morning ahead. Our first stop was at Jalan Mahmoodiah to see the Johor Royal Mausoleum, the final resting place of members of the Johor royal family. Built in 1895, the mausoleum' classic architecture was inspired by Victorian, Moorish and Malay designs. As we alighted from my car, hardly any birds were chirping among the fragrant frangipani trees and silent tombs but I heard chanting prayers from the mausoleum and a lone imam came to the open door. When he saw the tourists, he gave strict instructions, using a smattering of English and hand gestures, that the mausoleum was out of bounds and footwear should be removed before stepping onto the porch. But when Richard peeked inside from the open door, the imam paused from his prayers to point to each tomb and identified whom it belonged to, for his benefit. We left feeling rather solemn but I was glad our visitors saw the tomb of HH Sultan Sir Ibrahim who died on 8 May 1959 in Grosvenor House. Then we headed to Bukit Jepun, the hillock where Jalan Mariamah meets Jalan Petri, to see the place where Richard's grandparents lived in 1934. From a photo of this bungalow in his laptop, Richard had an idea of what he was looking for. I know that some of the old bungalows here are being used by Yayasan Warisan Johor [YWJ] or Johor Heritage Foundation, so I contacted my friend Haji Shafie Ahmad, to ask if he could let someone know that I was bringing visitors to look around. He arranged for his colleague to help us and when I parked in the compound and called Duan, he answered saying, "I can see you in your car!" where F.M. Still used to live? He must have been looking out of his window and spotted that strange car. A young man came out and after the introductions, escorted us on a walk along Jalan Mariamah to look at the other buildings used by YWJ here. After comparing the bungalows in the compound, Richard and Lindsay agreed that it was likely that the first bungalow - which closely resembled the old photo in his laptop - could be the government quarters where Richard's grandparents lived while they were in JB. Richard learnt that his grandmother was headmistress of Ngee Heng Primary School in 1934, 1937 and 1941. Opened in 1920 as Ngee Heng English School, it was first situated at the corner of Jalan Abdul Rahman Andak and Jalan Draper. In the 1930s, the school moved to Jalan Glendening and was renamed Ngee Heng Primary School. Since its inception, the school was led by English headmaster/mistress and teachers until 1984 when a Malay headmaster was appointed to that role. I brought Richard to the site at Jalan Glendening that comprised a concrete building and a wooden building, used as the JB District Education Office since 1982 when the school shifted to its current site at Jalan Abdul Rahman Andak. Richard walked about to snap photos, probably feeling quite sentimental that this was where his grandmother also used to walk. Then I drove to the underpass near Saujana, the Johor Chief Minister's official residence, which wound under the Inner Ring Road, to reach Sekolah Kebangsaan Ngee Heng, the current site of this historical school. Two security guards from the school came out, curious at why these foreigners were interested in their school. Ngee Heng School may not be a premier school now but in its early years, it produced many able statesmen, renowned academicians and professionals. It was a bittersweet moment as I thought about the legacy of English education here and felt sad that not many in the present generation acknowledge the far-reaching value of our English education. Richard easily connected with My Johor Stories, the contents of which are in English, and was compelled to write to me. And then we communicated effectively to make this experience in exploring the sites recorded in Jalan Astern - actually happen! Besides the pleasant surprise of discovering that out grandfathers knew each other in JB, Richard and I connected on other levels. One in particular, was how his maternal great-grandmother and siblings, were brought up in St Mary's Home, Singapore as "orphans of the Empire" while my dad was also brought up in a home run by Mr & Mrs George Wilson, missionaries at Elim Gospel Hall in Ipoh. Aware that Richard and Lindsay enjoyed their dining experience at Sea & Saw last night, I decided that we should lunch at Flowers in the Window, a charming cafe on Jalan Dhoby, run by the same owners. I had explained to them that "Sea" is the English translation of the co-owner's name in Chinese, Hai, and at the cafe, we were delighted to meet with my friend, Sea Wong himself! All too soon, it was time for Richard and Lindsay to leave for the next leg of their journey. They would head to Port Dickson so that they could spend Monday exploring Seremban before they caught an early flight out to Labuan on Tuesday morning. Sorry to be so slow to contact you after our visit to JB but it has been a real whirlwind since leaving last Sunday. Your generosity and our three nights in Johor Bahru, whizzing round various places under your expert guidance, will live on our memories for ever: All the things we did were great and so interesting especially the private visit to the new State Assembly and the classical music concert. JB is a complete contrast to Singapore and all the more enjoyable because of that. Stayed two nights in Port Dickson at the Lexis Water Chalets which overlooked the Straits of Malacca. The tropical thunderstorms across the water were quite something. We had one night in Labuan, which was interesting in its own right, although the church office was closed yesterday and today is a public holiday so we couldn't do much as everywhere, including the library, was closed. Now we're on the ferry heading to KK, Sandakan and Kinabatangan. We cannot thank you enough for your hospitality in JB and to discover our GFs worked together to manage the badminton association over eighty years ago, PLUS two photos to prove it, is something very special. Also next time you see Mr Sea, please thank him again from us for his generosity. Also Rashid, Dr Shan and David, we greatly enjoyed our time with them. When I get back to the UK I will address the memoirs and send you a copy as well as any photos or info that may be appropriate. Thank you again Peggy, Lindsay and I feel so lucky to have been able to spend a few days with you in JB and hope we can reciprocate in London before too long. PS have not been able to send this previously no WiFi. Now come up River Kinabatangan to connect before the crocodile hunt! It was good to know that they are pressing on in their journey in East Malaysia but I must be patient because it would be some time yet before Richard sorted through his photos and documents before getting around to sending me anything. I remember he told me his grandmother kept a handwritten copy of the Johor anthem and showed it to me on his laptop. This should be very interesting too! Until then, I wish Richard well and every success on his quest! Richard Dunn was on a quest to see and do as much as he possibly could on a trail from Singapore, Johor to Labuan to see where his family members once lived, worked or died. When he started researching places in JB online, Richard reached My Johor Stories where some of my stories gave him historical background and local perspective. Among other things, he learnt more about Johor’s heritage buildings, the cultivation of Johor’s first economy crops, pepper and gambier, and the Ngee Heng brotherhood! His family was among the English who came to the Far East while many Asian nations were British colonies. Johor, in particular, had a strong English influence as Sultan Abu Bakar was a good friend of Queen Victoria and the first two Johor sultans where distinguished as Anglophiles. In the recent Sultan’s coronation, we learnt how Sultan Abu Bakar even modeled the Johor royal regalia after that of the British monarch’s. Richard’s grandfather, Frank Mogford Still, better known as F.M. Still, was a good friend and confidante of Sultan Ibrahim, who reigned from 1873 to 1959. The sultan, who spent a great deal of time in London’s Grosvenor House, also passed away there. From his grandmother’s memoirs, Richard discovered that his grandfather was Chief Accountant in the Johor Public Works Department in 1928 and in 1934, he shifted into a house, probably government quarters, on Bukit Jepun. His grandmother, Florence May Still (nee Drysdale) was headmistress of Ngee Heng Primary School in 1934, 1937 and 1941. Grandfather was a Major in the Johor Military Force and also Inspector of Prisons, Johor. He was Honorary Secretary of the Royal Johor International Club and Johor Civil Service Club (now renamed Johor Cultural and Sports Club), and later also Honorary Secretary to the Royal Selangor Club. While he was in JB, F.M. Still was also President in the Johor Football Association and President of the Johor Badminton Association. This information was a helpful guide as to where I should take Richard but he had his own ideas – particularly about the palaces where his grandfather used to hang-out with Sultan Ibrahim – as recorded in his grandmother’s memoirs! Richard saw the 1902 Map of Istana Besar with surrounding buildings and its perspective in relation to the JB Prison from my story, Hills and Palaces – and wanted to see all these buildings! I realise that palaces, even the Istana Besar or Grand Palace in the city, is out of bounds to the public, but I was determined to show Richard the outside, for him to get a sense of the place and let him imagine its grandeur when his grandparents used to frequent those palaces. When I picked Richard and his wife from the hotel on Friday morning, he was armed with his travel guide books, laptop and camera. He had photos and documents loaded in his laptop to use as reference. So as I drove, he would tap away on his keyboard to pull up a picture or some document to show me. Our first stop was at the gates of Istana Pasir Pelangi to see the original building to a backdrop of beautifully maintained polo fields. In the early years, Sultan Ibrahim’s rubber estates were nearby and this was HH sultan’s country house and estate office. Then we made a stop at the former building of the Johor Civil Service Club (JCSC) at Seri Gelam, now refurbished as a restaurant and offices. Richard had read from My Johor Stories about JCSC’s rich history in JB and saw some photos of its new building at another site. My friends in JCSC administration, however, told me that they may not be able to find any old records, especially after they shifted into their new premises. We talked about the origins of the running social club, Hash House Harriers, which may have started in JB while the founding runners were based here. It was not until they were in the Royal Selangor Club when they formally named themselves Harriers, so the running club technically started in JB! Then we went to the gates of Istana Bukit Serene where we could only see the driveway into the palace. Once again, we wondered if Richard’s handwritten letter to the Johor Sultan ever reached him. My friends with the palace reminded me that Richard’s query should be directed to the president of the Johor Royal Council for any arrangements, if necessary. I realise that the timing was just not conducive for further plans but Richard was such a good sport about it and even ready to make another trip for this. We took a pleasant drive along the coast road to reach the main entrance to the Grand Palace and made a stop at its second entrance for a view of the recently refurbished Balai Zarah. I spotted groups of young people walking about – inside the palace grounds – even though it was supposed to be out of bounds to the public, and this aroused my curiosity. The sight of an English couple also made a group of female students walking to the gate, rather curious and Richard struck up a conversation with them, telling them briefly about his grandfather who was a good friend of Sultan Ibrahim. Soon we learnt that the students were doing a school project on heritage buildings and were out collecting information and taking photos. And of course, the students couldn’t resist capturing the moment with a photo memento of the English visitors! No visit to JB can be complete without a visit to the city’s iconic State Government Secretariat, now known as the Sultan Ibrahim Building on Bukit Timbalan, so we headed up that hill. And it only took a moment for the affable Richard to start a chat with a gentleman who was seated in the pavilion at the guardhouse! Then we went around to its other entrance at Jalan Abdullah Ibrahim for another view of this magnificent building designed with unique Indo-Islamic architecture that evolved in India. Work on this building started in 1939 and for decades, this building dominated the city’s skyline. Next to the Sultan Ibrahim Building was the unique octagonal shaped building of the Johor Military Force (JMF), in a neat and guarded compound. While the guard allowed Richard to snap photos, he cautioned us to stay out of their restricted zone. I told Richard and Lindsay that the duties of the JMF are now largely ceremonial as it continues in its services to the state and Sultan to this day. We saw the signboard in front of the JMF building written in Jawi, the Arabic alphabet used to write the Malay language, and it was only the next day, when we visited the Gallery in Sultan Ismail Buidling, Kota Iskandar, that we learnt more about the JMF. It was time for a spot of lunch so we headed to Tan Hiok Nee Heritage Walk were I showed my visitors Hua Joo, the traditional bakery and bought freshly baked banana cake. After a lovely lunch at Eh He Art Café, we browsed around the shops to see the charming new businesses in old buildings. I was delighted when Lindsay responded positively to my introduction of Bev C, our local fashionista who’s making a name for herself with her unique designs. It sure didn’t take long for Lindsay to pick out a dress to try on and decided to buy it! A tour of the JB Tiong Hua (Chinese) Heritage Museum gave the visitors more info about the historical development of JB since the 1800s and then it was time for afternoon tea. I realised that our banana cake was “outside” food but I was grateful that my friends at the Drums Café graciously let us enjoy the cake with our coffee. On our way back to the hotel, we drove through Jalan Ngee Heng and I pointed out to my visitors, the spot where our grandfather’s house and badminton court used to be before the land was acquired to build the Tun Abdul Razak expressway. I also pointed out that the site of the Ngee Heng School was up that way and we would see it on Sunday morning. Richard recalled reading about our family’s passion for badminton and while we were on this topic, I mentioned that legendary All-England champion, Wong Peng Soon, was our granduncle who was trained by our grandfather, Ng Ngoh Tee. It had an eventful day together but it was not over yet because Richard and Lindsay were joining me for the evening show at the JB Classical Music Festival, happening that same weekend. So after a rest and change of clothes, I was at the hotel again to pick them up to go to the show at Afiniti Medini. I saw Richard lugging his laptop into the car and it crossed my mind that there was no need to bring the computer to the show. But he was clearly bursting to show me something. I read no further. My jaw dropped in surprise! I was speechless for a bit until I found my voice again. How uncanny?! Who would have guessed that our grandfathers, not only knew each other but also worked together in the same badminton association!? I must confess that this shocking discovery was buzzing in my mind throughout the evening because I just couldn’t get over how Richard, a stranger whom I welcomed to JB in search of where his grandfather lived, worked or walked, also knew our grandfather! I begged mum to please look for it and when she looked into grandma’s old albums, she found it! By this time, I was heading out to meet Richard and Lindsay again for a tour of Kota Iskandar and I hugged this new discovery along with glee. Once again, Richard was holding his laptop, ready to show me something when he got into my car. From the Singapore Library’s newspaper archives, he found a published group photo with our grandfathers at a badminton event! Then it was my turn to tell him what my mum said and I too had a photo to show him. Richard and I were simply amazed at the discovery that our grandfathers knew each other! His quest to discover more about what his grandmother recorded in Jalan Astern, continues in the next exciting episode of his journey to more sites in JB. I often receive mail from readers and on May 19, an email from Richard Dunn in London started us corresponding because he planned to visit Johor Baru in June. I have been reading your fantastic blog which has been of great interest to me. I am from a British family who, through my Great-Great Grandfather, first came out to the Far East. Dr Wall set foot in Labuan in 1873 and died there circa 1879. However his two daughters and son were shipped to Singapore in 1877 aged 9, 7 and 4. They never saw their father or mother again and started life in Singapore living at St Mary's Home in Tank Road and all attended Raffles School in Bras Basah Road. And there began nearly 80 years of association with Singapore and Johore. My Grandmother, born Singapore 1893, wrote extensive diaries of her time in the Far East and my Grandfather was very close to Sultan Ibrahim up until 15 February 1942. Maybe there is something interesting in them for you? I will be in Singapore from 9 June for a few weeks. Below I have included the profiles of some of my family in the Far East. Richard’s message was rather lengthy as it listed details about his family members who were in this part of the world since his great-great grandfather arrived in Labuan in 1873. It looked like he did some serious research and came up with a long list that included a section where his maternal grandfather and grandmother were in JB. After his great-great grandfather passed away in Labuan, his three children were shipped to Singapore as “Orphans of the Empire” and they grew up in St Mary’s Home. One of these three children was Alice Frances Wall, his maternal great-grandmother. In 1889, she married James Henderson Drysdale. From this couple (his great-grandparents), his grandmother, Florence May Drysdale, was born in Singapore in 1893. She married his grandfather, Frank Mogford Still, at St Andrews Cathedral in 1918. While the portion about his family in Labuan and Singapore listed some familiar places, the part where his grandfather and grandmother lived in JB, was of particular interest to me. As Richard discussed the names and places in JB, I highlighted them [in bold] and I assured him that I would show him these places – wherever possible – when he was here. It was especially intriguing where he pointed out that his grandfather was, “Right hand man to Sultan Ibrahim,” and I made a mental note to find out more. Richard revealed that he gleaned most of the information from his grandmother’ memoirs which she entitled, Jalan Astern. I asked him to repeat that title because I thought it was such a charming phrase with two words: one in Malay and the other, so typically English! Richard’s grandmother, a former headmistress of Ngee Heng Primary School, was clearly conversant in Malay and I was totally charmed by how apt it was to name her personal journal, Jalan Astern! Locals, by the way, have long corrupted the word, astern, and choose to say, “gostan” which is accepted to mean ‘reverse or go backwards,’ instead of the proper word, astern! I didn’t know it then but Richard did extensive preparation and groundwork before starting on his trip out to the Far East. From his grandmother’s memoirs, he looked up names and addresses, and wrote to them informing about his impending trip and how he would like to see the places which his forebears lived or went to school in Singapore. In Johor, Richard also wrote to the Johor Military Forces, Yayasan Warisan Johor (Johor Heritage Foundation) and Johor Civil Service Club as well as to Ngee Heng Primary School. He, however, did not receive any replies except a rather impolite line from the Heritage Foundation – which occupies the site of the house at Bukit Jepun where his grandparents used to live in 1934. I must admit that I was rather skeptical if his letter would even reach the Sultan because the address was not quite complete and addressed His Royal Highness as HH Ibrahim Ismail of Johor while his name is Sultan Ibrahim Ismail Sultan Iskandar. Privately, I hoped that the postman would just do his job and proof to our English friends that we know who our Sultan is and where His Highness lives! Richard on his laptop, in my car! In his grandmother’s memoirs, she often referred to the first Sultan Ibrahim as “HH,” as they were close friends and she was friendly with his sister, Tengku Ampuan Meriam. Richard was clearly on a quest to see and do as much as he possibly could on a trail where his family members once lived, worked or died. He was travelling with his wife, Lindsay, and when they first reached Singapore, they had appointments to meet with people in the Singapore Chinese Girls’ School and the Raffles Institution. Later, I learnt that they also visited the Changi Prison where his grandfather was incarcerated as a Prisoner of War during the Japanese Occupation. And at the Kranji War Memorial, they found the tomb of his maternal great-uncle Francis (Frank) Stewart Drysdale. In 1915, he was a private in the Singapore Volunteer Forces and perished, aged 17, as the youngest volunteer to lose his life in the Singapore Mutiny. While Richard was already in Singapore, I received his email saying that they have planned a few days in JB before leaving for Seremban and onward to Labuan and other towns in East Malaysia. He did his research on hotels in JB and asked for my opinion before deciding on his choice. He was clearly internet savvy and was booking hotels and air tickets online – on the go! It was Thursday, when we arranged to meet in the hotel lobby. When I arrived, it was not difficult to spot an Englishman talking animated to the concierge, and that was how I finally met with Richard and Lindsay. Over lunch, we discussed an itinerary that should show him as much of what he wished to see during his stay here. I realized that it was rather short notice for much of what we wanted to do, especially so because this visit coincided with a weekend during Ramadan. But I had the opportunity to share with them, some local culture and traditions that interested and fascinated them. In the next two days, I got to know Richard and his wife – just as he got to know me better – over and above what he already knows from reading My Johor Stories. It turned out to be quite an extraordinary experience, not just for the visitors but also for me. But more about that later. Richard’s quest to discover his links here is in the next exciting episode of his journey to sites in JB based on Jalan Astern, his grandmother’s meticulously recorded memoirs. Retired English and Art teacher, Abdullah Yusof, is displaying his art and inviting art enthusiasts and students over to learn the finer points of sketching and painting. From now till September 30, Abdullah, 73, is showcasing a collection of his works in two themes: Nostalgia Johor and Faces and Figures, at the showroom of Johor Area Rehabilitation Organisation (JARO). While some of his favourite pieces are Not For Sale, most of the exhibits – mounted or framed – are available for sale. “Art is the ABC of everything. It starts with a dot. When we put the dots together, it produces a shape and form. From art, students learn to read and write,” said Abdullah who believes that art is the groundwork of a good education. After a long and illustrious career in art education, this retiree wants to give back to the community by sharing some tips and guidelines in the pursuit of art. “I would like to see more young people taking up art as a hobby and career,” said Abdullah who aims to use his time to educate and help them explore the potential art has in enriching their lives. Abdullah, who was educated in SK Ayer Molek, fondly recalls his first sight of a wall mural done by British soldiers in the school, which was so eye-catching that one could not help but be inspired. He later learnt that this mural was done in the Impressionist style. While training in the Malayan Teachers College in Kuala Lumpur, his college lecturer, Lim Ah Kow, gave Abdullah the opportunity to create a mural and he did not hesitate to design a mural in front of the auditorium. In 1967, Abdullah’s first job posting was to Tanjung Karang in Selangor, then a fishing village. Here, he came across a boy fishing for king crabs and could not resist making a sketch of this boy with his king crabs. Abdullah's sketch of "Boy & King Crabs"
This original sketch is on display, one which Abdullah fondly treasures because it was completed spontaneously. This sketch, “Boy & King Crabs” was later reproduced in oil on canvas. In 1970 when it was exhibited in the former Johor Rest House, this piece was bought by a visiting American tourist. The sale of this particular piece encouraged Abdullah to pursue his passion for art. Over the years, he accomplished a wide range of projects including a series on Mosques and Traditional Dances, Heliconias and the Waterfalls, Flora of Malaysia and A Symphony of Orchids. Working mostly in acrylic, Abdullah also uses watercolours, gouache and oil on favourite subjects like flowers, figures and Malaysian scenery. Since 1975, his art has been exhibited in galleries and events from Johor Baru to Kuala Lumpur and Shah Alam. Traditional homes in Johor Baru is another of his favourite subjects. Take a closer look at the exhibits and you may recognise some buildings at Jalan Dato Dalam and Jalan Nong Chik which he has preserved in his paintings. Since his teenage years, Abdullah enjoyed studying faces and features which started him in sketching portraits of popular movie stars. One does not have to be a popular movie or music star to have your portraits sketched because he would sketch any interesting face that he came across. Just look out for, “Boy with Porcupine Hair” done in charcoal, a recent portrait Abdullah did of a young man whom he met at the Johor Baru Tiong Hua Heritage Museum. Abdullah has been accepting commission work since 2002 and some of his work has gone into private collections while some pieces were reproduced in greeting cards. From Sunday to Thursday, between 2pm to 3pm, the artist will be present to guide budding artists in sketching and painting in various media. So bring your art materials along to JARO where Abdullah will help to cultivate your artistic skills in a hands-on workshop. JARO, located at Jalan Sungai Chat, JB, is open Sunday to Thursday from 8am to 5pm. For appointments, Tel; 607 – 3311964. The International Women’s Association (IWA) of Johor Baru recently held their Mid-Year charity bazaar at the lobby of KSL Hotel and Resorts to raise funds in support of various local charities. 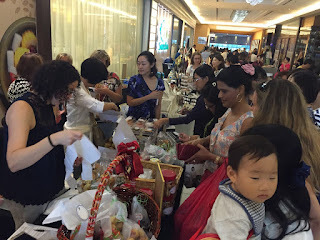 Opened from 10am to 4pm, it was a one-of-its-kind bazaar where shoppers found unique items at stalls set up by IWA members from more than 25 nations including Australia, Belgium, Finland, Germany, India, Korea, Netherlands, England, Scotland, the United States, Singapore and Malaysia. This vibrant mix of cultures and cuisines gave birth to IWA’s popular Bake Sale where freshly made breads, scones, jams, muffins, cookies, cheese puffs and healthy chia seed balls were completely sold out by the end of the bazaar. The IWA is a non-profit charity organization established in May 1999 to organise fund-raising social events to contribute towards healthcare, education and other social needs in and around JB. Since its inception, the IWA has raised funds to support various causes including the children’s welfare home in Saleng, the Rotary Dialysis Centre and several Tamil schools in Kulai. IWA has established a long-standing relationship with JARO or Johor Area Rehabilitation Organisation, a charity which had a table to promote their handicrafts. These products are created in rattan, paper and beautiful batik fabric by physically disabled artisans who are trained in various skills in the basketry, book-binding and tailoring sections of their sheltered workshop. “IWA strives to encompass and embrace charity in all its forms – caring and contributing to the community here – which we now call our home,” said IWA JB president, Jodie George. The IWA tagline, Connecting – Caring – Contributing, is a reflection of how IWA recognises its role in the community. While IWA is helping expatriate women adjust to living in a foreign country, they know that they also have a social purpose in supporting the needs of local charities. Established brands and vendors from JB, Singapore and Kuala Lumpur came together to promote their products at the bazaar. They included KaNi – designs from Finland, Zari – home décor from Central Asia, Mesmerised – organic soy candles, Karitree – spa products from South Africa, S&L Vinters – wines from around the world, Safiyya Mediterranean – olive oils and health juices from the Mediterranean, Pukka Paisley – Soft cotton hand embroidered Indian clothes, Angelinascloset – fashion jewellery and accessories, Fit for life – Health supplements & creams, Rolandprime – paintings by Roland, Moniko – hands bags made from vintage Kimono and Amber touch – a range of Amber jewellery. “The profits from this bazaar was over RM4,000,” said IWA charity coordinator, Apurba Datta, who added that it will benefit JARO, Care2Share supporting orphanages and JEiWA, an NGO that provides support to abused professional women. IWA also expressed their appreciation to KSL Hotel & Resorts general manager, Mahadi Mathana, for their generous partnership in providing the space for the event.